Dream. Dress. Play. : Make It Monday! 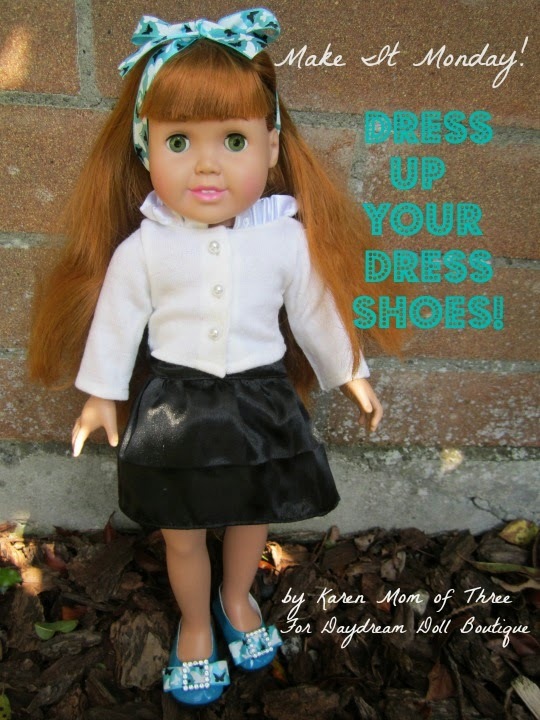 Dress Up Your Dolls Dress Shoes! and some slider notions you can find usually in your scrapbook section of the craft store! Step 1- Assemble all your supplies. Cut two 4.5 inch pieces from your ribbon. Step 2- Feed your ribbon through the slider as shown in the photo above. Step 3- Center your slider and flip your ribbon over. Step 4- Cut a small amount from your Fabric Fusion Tape and place it on the middle of the back of the slider. Press one end of your ribbon into place, then repeat with more tape and fold the remaining side into place. Step 5- Repeat step 4 on the remaining ribbon and slider. Step 6- On the back of your bows and sliders cut a strip from your Fabric Fusion Tape and place it on the back or the bow. Peel the backing off the tape and center and press your bow in to place. Repeat on the remaining shoe and slip on your dolls feet! 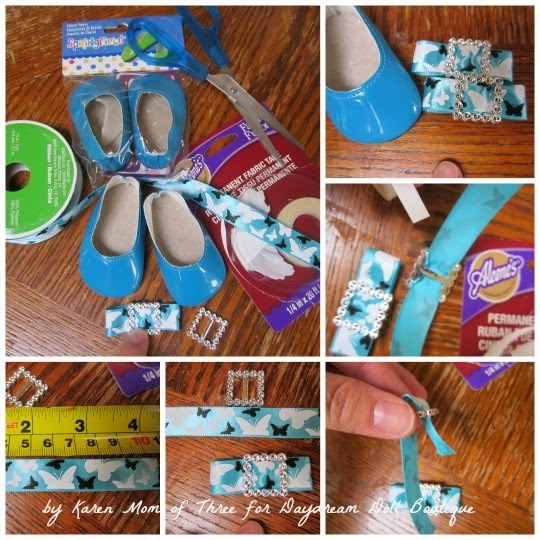 I loved using this tape from Aleene's and I love to create because it was so strong and requires no drying time and is no mess. This would make a great craft for a party or rainy day craft! I look forward to sharing more doll crafts with you again soon!